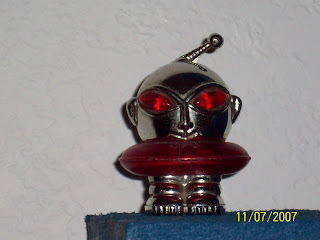 Lightersville: Singing Alien- "its a small world"
This was the lighter that started my collection of lighters. It was given to me by a long time family friend, who is also a long time junk collector,lol. He usually brings the best of his junk to me to see if I want it before it gets 'lost' in his piles of stuff. He has brought many things but this was the first lighter. I have no idea where he got it from, there isn't any markings on it anywhere saying where it was made or anything like that. I call this the 'Singing Alien" because aside from the lights and noises it makes when it is in use, it will sing a song(with music, like humming). When I first heard it, it tripped me out since I did not know it did that. I was showing it to someone, so it was lit around five or six times. My friend didn't stay long, about 10 minutes or so. When they left I put the alien lighter on the shelf and went back to watching TV. About a minute later I heard 'its a small world' playing and it wasn't on the TV. So, I got up and started putting my ear up to stuff in the area where it sounded like it was coming from, trying for find what was making it music. I bet I looked silly. The music was slowing down, so I had to find it before it stopped. Luckly, I was close enough to the Alien lighter to see from the corner of my eye, it's last few flashes of its lights. I grabbed the Alien off the shelf and repeated what me and my friend did earlier, lighting it five-six times. I sat down and put it on the coffee table in front of me and starred at it waiting for it to do it again. It finally did it again, I had to light a few more times, but it did it. I a glad I wasn't hearing thing,lol. Now, when I show it to people I let them discover it the way I did. I just make sure it has been lit enough times before I 'put it back' on the shelf. Most people have the same reaction I did, they get a confused look on their face and start looking for where it is coming from. everyone gets a good laugh out of it.